Normal Eustachian tube (ET) function is important for fitness to dive. Eustachian tube dysfunction may result with ear injury during diving. The most common diving injury related to Eustachian tube dysfunction is middle ear barotrauma, and less common but more grave is inner ear barotrauma (IEBt). While middle ear barotrauma usually heals well, inner ear barotrauma may cause permanent damage if not recognized and treated on time and thus, the prevention of IEBt is very important. The Diving and Hyperbaric Medicine Volume 46 No. 2 June 2016 brings three articles addressing these issues. Kitayima and co-authors studied Eustachian tube function in 16 divers who experienced IEBt and in 20 healthy divers without history of IEBt. They correlated the function of Eustachian tube to the incidence of IEBt. They measured the opening pressure for ET, the maximum volume of the air in the middle ear and the speed at which the equalization occurs. In the ideal conditions, the pressure differential needed to open the ET in either direction is 200 to 650 daPa which corresponds to a pressure gradient caused by depth change of 20 – 65 cm or 8-26 inches. The maximum volume of air in middle ear varies from 0.2 to 0.9 ml. The paper describes three main type of ET based on the equalization characteristics: patulous (open) ET, normal ET and stenotic (narrowed) ET. The patulous ET is open permanently or it takes pressure differential of less than 200 daPa to open it. Normal ET is collapsed but it takes less than 650 daPa to open it and it fills or empties instantaneously. The stenotic ET takes larger pressure (up to 1200 daPa/120 cm H2O measured) to open it or it fills and empties very slowly. In healthy divers without a history of IEBt, one third had slow equalizing ET but the pressure differential required was within normal range. They avoided IEBt so far, probably by practicing slow ascent but they often experienced alternobaric vertigo. Among divers with IEBt, most had dysfunctional ET requiring either greater pressure differential to open it and/or it took longer time to equalize. However, some divers with IEBt had normal ET function at the time of measurement. Divers with IEBt and perilymph fistula had more severe ET dysfunction. Authors suspect that excessive pressure caused by forceful Valsalva may have been the cause of IEBt in some divers and especially in those with normal opening pressures but who became impatient with equalization and blew to strongly. Morvan and co-authors presented a series of 11 cases of perilymphatic fistula due to IEBt in scuba divers. The perilymphatic fistula is most severe form of IEBt but it diagnosis is not always obvious. Dizziness, hearing impairment and tinnitus after scuba diving indicate likely injury of inner ear but the cause may be either decompression sickness or barotrauma. Delayed onset, fluctuation and progressive deterioration of deafness point toward perilymph fistula. In either case, occurrence of cochlea-vestibular symptoms after a dive is an emergency. Early evaluation should be focused on decompression sickness and need for hyperbaric oxygen treatment which may prevent permanent damage to inner ear. Effort must be made to exclude perilymph fistula before recompression treatment. However, that is not always possible and divers with a fistula sometimes get treated but there is no indication so far that it is deleterious if necessary precautions are taken. If there is no improvement on recompression or if there is worsening of symptoms, the treatment should be aborted and perilymph fistula considered. Guenzani and co-authors reported case histories of nine cases of inner ear decompression sickness (IEDCS) in recreational technical divers who were identified through an online questionnaire. The most common leading symptom in IEDCS was vertigo, reflecting affliction of vestibular part of inner ear. The deafness which dominates in IEBt was seen in only three cases reported in this paper. IEDCS occurred in isolation (4 cases) and with other DCS manifestations (5 cases). The symptoms occur during ascent or soon after. IEDCS occurs more often than IEBt and due to growing participation in technical diving we may see it even more often in the future. Presentation of these three papers in the same volume, seem like a good opportunity to re-fresh our knowledge about inner ear injuries in diving. Early recognition and prompt treatment are important to reduce the risk of permanent damage to hearing and orientation in space. Kitajima N, Sugita-Kitajima A, Kitajima S. Quantitative analysis of inner ear barotrauma using a Eustachian tube function analyzer. Diving Hyperb Med. 2016;46(2):76-81. Morvan J-B, et al. Perilymphatic fistula after underwater diving: a series of 11 cases. Diving and Hyperbaric Medicine. 2016;46(2):72-75. Guenzani S, et al. Inner ear decompression sickness in nine trimix recreational divers. Diving and Hyperbaric Medicine. 2016;46(2):111-116. Sudden death in adults is often caused by an unexpected loss of pulse due to stop of heart pump (sudden cardiac arrest; SCA) followed shortly by a loss of consciousness and muscular power (collapse) without an external cause. SCA is a cause of over 550,000 deaths in USA including out-of-hospital and hospital patients. Regardless of circumstances, survival remains very low (7%). SCA affects people with and without history of previous heart disease. According to DAN fatality data, about one quarter to one third of scuba fatalities may be caused by SCA which, in addition, may be sealed by drowning. Although cases of SCA progress rapidly the name does not imply that cardiac arrest occurs without warning signs. Medical professionals know that in some cases warning signs like chest pain and dyspnea precede SCA long enough to initiate pre-emptive intervention. We have also learned from the DAN scuba fatality monitoring program that in some divers death ascribed to SCA obvious warning signs were present before the fatal dive. How prevalent these warning signs are in the general SCA patient population was not known until a study done by Marion Eloi and coauthors published last December. The study identified SCA patients from Portland, Oregon metropolitan area hospitals who had symptoms assessments done four weeks prior to the SCA event. Total of 839 patients were identified. The mean age of patients was 52 years and most were males (75%). Fifty-one percent of patients had at least one warning symptom. There was no difference in percentage of males and females with warning symptoms. The most common warning symptoms were chest pain and dyspnea. Men had more chest pain and women more dyspnea. Most SCA occurred while patients were at home. Warning symptoms occurred one hour before SCA and in many cases even 24 hours before. Only 19% with warning symptoms called the emergency medical services (911). Callers were more likely to be patients with a known history of heart disease. The mean response time between a 911 call and EMS arrival was seven minutes. Initially shockable rhythm was present in about fifty percent of the cases. Survival in those who call 911 was 32% in comparison to those who did not call. The tak e home message is that chest pain and dyspnea in middle age and older individuals even without known heart disease history, should be recognized as a warning sign of a life threatening condition and patients should be prompted to seek emergency medical care before SCA occurs. Even in the best of circumstances, when emergency response is initiated after the occurrence of SCA, chances of survival are slim. However, a prompt reaction to warning signs may prevent SCA and in case it still occurs, it increases survival rate. Other symptoms that may precede SCA but are less specific are syncope, palpitations, abdominal complains and influenza-like symptoms. These symptoms may be difficult to recognize as warning signs of SCA without history of heart disease. For divers it is important not only to acknowledge likely cardiac symptoms (chest pain and dyspnea) and call 911 but also to abstain from diving in case they have any symptoms until they have a clearance from their diving physician. Once SCA occurs, one does not have time to get surprised but those who act upon warning signs, may pre-empt sudden death. Marijon E, et al. Warning Symptoms Are Associated With Survival From Sudden Cardiac ArrestCardiac Arrest. Ann Intern Med. 2016;164:23-29. doi:10.7326/M14-2342. Every year the Sports & Fitness Industry Association (SFIA) releases a report that reviews participation data on various sports and recreational activities. The 2015 report pertains to 2014 participation data and is based on 10,778 online interviews (5,067 individuals and 5,711 households) among one million US online panel members. The survey asked about demographics and participation in various physical activities and sports. According to this report, 3.145 million Americans (1.1 percent of population) participated in scuba diving once or more in 2014, which is a 0.9 percent decrease over 2013. However, the average participation for the last two years shows a 1.3 percent increase over the average for the previous five years. There are 2.252 million casual participants in scuba diving (defined as making between one and seven dives per year) and 893,000 core participants (defined as making eight or more dives per year). Males make up 66 percent of casual and 74 percent of core participants. Figure 1 shows the age distribution of casual divers versus core participants. 1 percent of casual and 57 percent of core participants are between the ages of 25 and 54. 7 percent of casual and 21.2 percent of core participants are younger than age 25. 2 percent of casual and 21.8 percent of core participants are older than 54. The rate of participation (the percentage of population that participate in scuba diving) by age group is shown in Figure 2. In the 18 – 44 age range, participation for the casual divers is between 1.2 and 1.4 percent and for the core divers between 0.2 and 0.4 percent. Participation rates vary with age. Casual participation rates increase continuously until age group 35-44 and decreases sharply afterwards. The core participation practically does not vary between age 25 and 64 (3-4 percent) but drops at older age (0.1 percent). Interestingly, both casual and core participation rates for children (6-12) are several times greater than for 65+ age groups. This may be partly because the later includes wider age range. As shown in previous reports, scuba diving participants are on average wealthier and better educated than the general population. Data about cross-participation of scuba divers in other activities shows 3 – 22 times higher participation indices in comparison to the general population. This pertains to aerobic activities, participation in individual and team sports as well as in extreme sports. Nearly 46 percent participate in running/jogging and 36 percent swim for fitness. It is not known what is the overlap nor how many divers do not participate in other sports. However, it is encouraging to see that divers participate in sports more than the rest of population because in the past the DAN medical emergency line and Fatality and Injury monitoring program has observed that some divers get injured due to inadequate physical fitness. More precise data are necessary to identify those who need some additional encouragement. An interesting study conducted by DAN Europe and presented at the European Underwater and Baromedical Society (EUBS) 2015 meeting in Amsterdam studied risk factors of decompression sickness in recreational divers and proposed how to reduce the risk of getting bent. The study used data recoded in DAN Europe Dive Safety Laboratory (DSL) Database and compared dives that resulted with DCS to dives that left diver’s symptom free. There were 327 DCS cases (206 males and 121 female divers) and 65,304 symptom free dives. Data included electronic dive profiles, diver data and outcome data. Researchers explored possible contribution of dive profiles, age, gender, height, weight of divers, workload during dive, dry vs. wet suit, water temperature, acute health problems and other problems during dive. The most significant difference between dives resulting with DCS and symptom free dives was in the dive profile. DCS dives were deeper (33.8 vs. 29.1 msw) and of longer run time (50 minutes vs. 39 minutes). Women were overrepresented among divers with DCS (37%) in comparison to their representation in DSL database (17%). It is important to note that most of DSL dives were collected prospectively while most DCS dives were include retrospectively and thus do not provide for calculation of rates. The mean age appeared higher in DCS cases but the difference was too small and of no practical significance. Other tested factors like weight, height, workload, type of dive suit, water temperature, acute health problems and problems during dive did not appear different between the two groups. The study went a step further and tried to find a practical measure of dive exposure severity that divers could use to control their risk of DCS. They estimated the gradient factor (GF) in each dive and did group comparisons. The gradient factor is the mathematically estimated ratio of the maximum tolerable supersaturation in tissues, an estimated saturation during decompression from a given dive while assuming “standard” conditions. When saturation of the tissue equals the theoretical supersaturation the GF equals 1. When saturation of the tissue exceeds maximum tolerable supersaturation, theoretically gas cannot stay in solution any longer and free gas occurs in tissues and circulation. Over time, we have learned empirically that pushing the limits (diving until the GF gets close to theoretical limit) results in increased risk of DCS and that GF should be less than 1. The empirical wisdom was confirmed with this study too, as is shown in Figure 1. The GF was greater in the DCS group (0.47 to 1.15 and mean value of 0.79) compared to the symptom free group of dives (0.21 to 1 with a mean value of 0.67). The possible practical implication is that by setting dive computer GF limits to lower levels divers may reduce their risk of DCS. Depending on personal risk tolerance, the GF setting may vary but should not be greater than 0.80. It is important to note that in deeper diving the GF game becomes more complex and the optimal GFs vary with depth. It is beyond the scope of this blog to discuss it. For more detail read the DAN Decompression Sickness Health and Diving References Series booklet. Divers must learn in-depth theory behind the GF practice before they start to make adjustments. It is also important to warn that a GF is not measured but rather mathematically estimated based on depth, time and inert gas without taking into consideration other factors that can greatly change gas solution dynamics. This study also shows that the effect of depth-time on outcome of decompression is overshadowing possible effects of other observed factors. However, this was an observational field study where such factors are not really measured and so the reader should not take it as far as to conclude that workload during dives does not matter. Instead, whenever exerting oneself during a dive more than usual, a diver should cut the time at depth short. This may compensate for the increased blood flow and on-gassing caused by exercise. The diver could also extend decompression time. The presentation of this study at EUBS was a preliminary study. More thorough analysis will be presented soon in a scientific journal. Seizure due to CNS oxygen toxicity in divers breathing a hyperoxic gas mix underwater is very likely to cause drowning. Some anecdotal reports indicate that CNS oxygen toxicity may be more common during night activities. A research team from Israel Naval Medical Institute in Haifa, studied the effects of night activities and melatonin on possible modification of susceptibility to oxygen toxicity in rats. Melatonin is widely present in animal and plant species, however its physiological function differs depending on the organism. In animals, it is produced by the pineal gland and is associated with regulation of diurnal (circadian) rhythm. With the onset of darkness, the pineal gland begins secreting melatonin reaching maximum production in the early morning hours and stops with the onset of daylight. Melatonin promotes sleepiness and contributes to a healthy and restorative sleep. It also contributes to antioxidant and anti-inflammatory processes. In this study, rats were exposed to 12 hours of light/dark cycles to affect melatonin production over a three week period. The control and experimental groups were kept awake during the day and night, respectively. At the end of this period melatonin level in the blood was measured. Each group was divided into two subgroups, one receiving supplemental melatonin and the other a placebo before exposure to 5 ATA oxygen in a hyperbaric chamber. The time to onset of convulsions was measured. In addition, researchers measured the levels of enzymes affecting reactive oxygen and nitrogen species. Oxygen convulsions occurred much faster in animals active at night. The rapid onset of convulsions was associated with a reduced level of melatonin. However, provision of external supplemental melatonin did not affect resistance to oxygen toxicity. 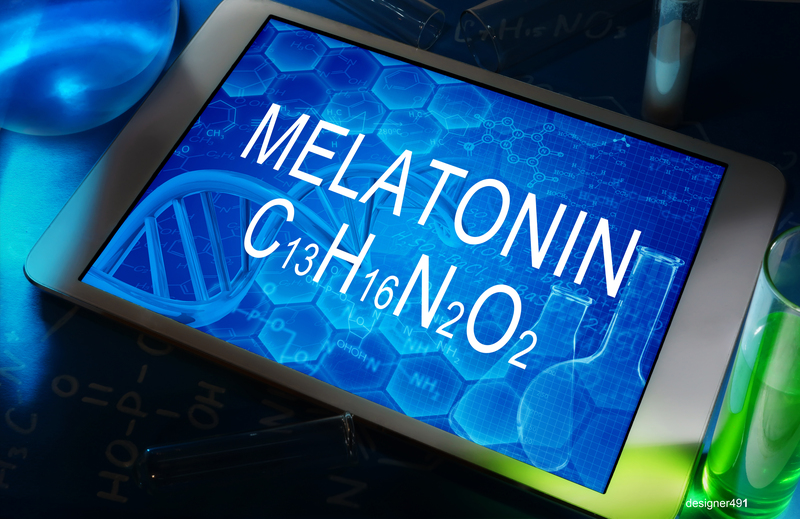 The effects of external melatonin on the level of antioxidant enzymes varied. Oxygen reactive species were more affected than nitrogen reactive species. The most important finding of this study was that night activity represented an additional risk factor for the development of CNS oxygen toxicity in rats. This was likely caused by changes in diurnal rhythm which could not be compensated by administration of external melatonin. For divers this raises the question of whether diving at night increases the risk of oxygen toxicity as well. Although taking melatonin before a night dive may not provide any preventative benefits or protection against CNS oxygen toxicity, it can be beneficial in other ways. Melatonin may help with jetlag by supporting a healthy sleep cycle and by re-setting the body’s sleep-wake phases. Eynan M, Biram A, Mullokandov M, Arieli Y. Susceptibility to CNS oxygen toxicity following a switch from day to night activity is associated with changes in melatonin and antioxidant enzyme activity. Oral presentation, EUBS 2015, Amsterdam.